Aerobic granulation is seen as the future standard for industrial and municipal wastewater treatment and subsequently research efforts are quickly developing in this field. 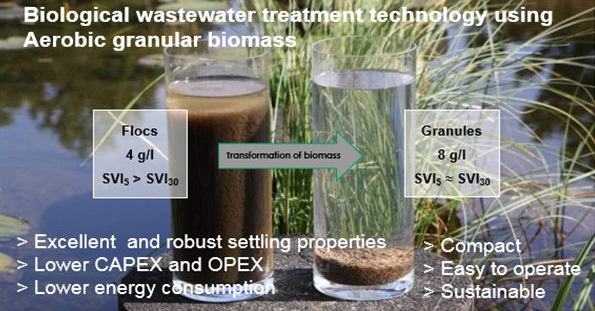 As an outcome of a concerted Dutch program, an aerobic granular biomass technology has been scaled-up and implemented for the treatment of urban and industrial wastewater. 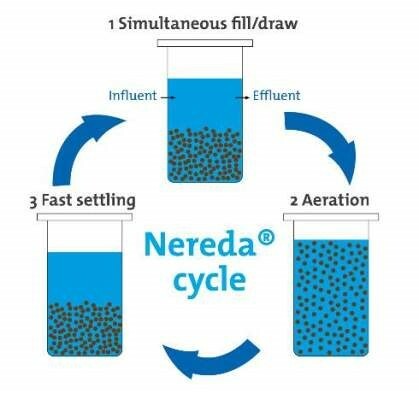 This Nereda® technology is considered being the first aerobic granular sludge technology applied at full-scale. Discovered in 1995 and further developed by Mark van Loosdrecht from the Delft University of Technology (DUT), the process of using aerobic granular biomass for wastewater treatment has been scaled up and engineered to suit commercial applications by Royal HaskoningDHV, a Dutch E+C company and has been commercially branded as Nereda® Technology. WABAG signed a License agreement with RHDHV for applying this Technology in India and Switzerland. The Nereda® technology has been applied in various industrial and municipal applications and demonstrated its robustness and stability. The first full-scale industrial applications date back to 2005, while in parallel the technology was further scaled-up for municipal application. One of the most critical aspects of the activated sludge process has always been the separation of biomass and treated water. Besides the development of physical separation techniques (membrane bioreactors) the improvement of settling properties of the activated sludge has been an important research topic. The basic requirement for biomass with good settling properties is a granular structure based on compact, dense, large particles with a high specific gravity. Operating data from the first municipal full-scale plant confirm the projected advantages with regard to treatment performance, energy-efficiency and cost-effectiveness. The technology, now applied at tank sizes similar to the world’s largest SBR-tanks, is considered proven and applicable for even the largest applications. Significant improvements regarding process stability, effluent quality (e.g. TN <5 mg/L, TP <0.3 mg/L) and energy savings (>30 %), compared to traditional activated sludge processes, have been demonstrated in all the operating plants.